File photo Complaints about the Bath Road property include noxious weeds and high grass, overgrown bushes, fallen trees, pungent odors, animal infestations and the dilapidated condition of the unoccupied house. BATH TOWNSHIP — Bath Township Zoning Inspector Jim Miller addressed two ongoing zoning issues in the township before the township board of trustees Aug. 1. Miller told trustees he had been making progress dealing with the zoning violations at a vacant property, located at 4953 Bath Road. A small group of township residents appeared before the board July 18 to voice their concerns about the nuisance property that borders their homes. Their complaints included noxious weeds and high grass, overgrown bushes, fallen trees, pungent odors, animal infestations and the dilapidated condition of the unoccupied house. Miller told the residents that he would explore the process for removing a tree off the roof of the house. Township Trustee Steve Ross said the township would start mowing the noxious weeds and tall grass. The township has dealt with the unending zoning issues at the property for approximately eight years and held a nuisance hearing in 2016 to attempt to rectify some of those issues. The board of trustees unanimously approved Resolution 33-2016 which allowed them to declare the residential structure insecure, unsafe and structurally defective. Miller said a register letter would be sent to the property owner, Joseph Sunday, who would have seven days to comply and clean up the property. If Sunday does not comply, the township trustees would then move forward with the abatement, control or removal of all nuisances on the property. Any expenses that would incur during the process would be paid out of the township’s general fund, then collected as additional taxes on Sunday’s property tax bill, and ultimately, returned to the township’s general fund. 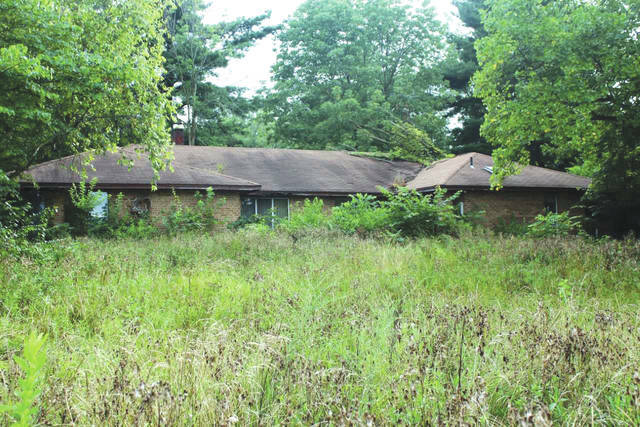 In a 3-0 vote, the township trustees agreed to hold a public hearing about the nuisance property at 7 p.m. Wednesday, Aug. 15, pending approval from the Greene County Prosecutor’s Office. Miller also addressed another zoning issue that involves an agricultural-zoned property, located at 1156 Herr Road. The 14.737-acre parcel is owned by Pitstick Renewable Energy LLC, and 4.79 acres of the parcel currently houses the Dovetail Energy LLC Bioenergy Facility. Miller explained that after reviewing the state statutes, Steve Anderson, Greene County Regional Planning Director, the county prosecutor, and he came to the conclusion that the biodigester operations was an agricultural activity. https://www.fairborndailyherald.com/wp-content/uploads/sites/50/2018/08/web1_nucprop2.jpgFile photo Complaints about the Bath Road property include noxious weeds and high grass, overgrown bushes, fallen trees, pungent odors, animal infestations and the dilapidated condition of the unoccupied house.